This is not a long-distance review, but rather one with an almost-zero carbon footprint - let's say 20 yards. Which is indeed the distance separating my house from Aladino and Lidia Minucci's pastry shop, where I literally grew up. I should point out that I'm not a sweet tooth, but 40 years ago I'd visit Aladino (and never was a name so appropriate for one who seems to hold a magic lamp in his hands) to enjoy wonderful tuna or Russian Salad sandwiches. Then I lived further away, in Poggibonsi's "suburbs," and a stop at Aladino's was a prerequisite before ambling up and down the main drag. 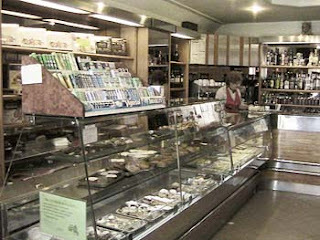 Then as now, behind the counter was Lidia, who was an institution known by all, because she brightened almost everybody's day with "sweets and savories." In the forty-odd years Lidia and Aladino have been there the shop hasn't changed a bit: a small narrow place that greets you with, on the left, a display case filled with brioches, budini, beignès, and then there's the espresso machine, with the savories: tarts, soft rolls, triangles, and schiacciatine, almost all filled with the Aladino's sauces, which have maintained a tasty continuity for close to half a century. Half a century in which the Minucci family never considered expanding, or getting themselves noticed by the specialty press, but rather concentrated on doing their business as well as possible. 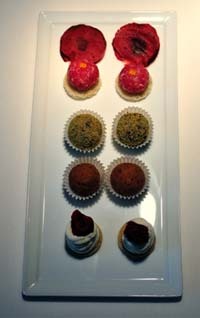 And to think that I have taken their treats to several events, without telling them. Today Aladino, who is past 70, still works in the kitchen of the shop from 4 in the morning until 8 in the evening. 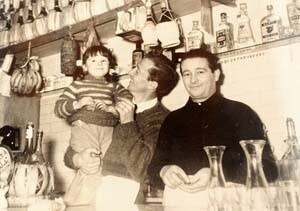 Fortunately, in the past few years his son Stefano has joined him, but he doesn't want to stop working, and therefore when there's less to do in the kitchen he comes behind the counter to help Lidia. Their specialties? I've already mentioned the savories, while on the sweet side their stalwarts are the traditional Tuscan and Sienese specialties. First of all, one of my absolute favorites, Pan dei Santi. It's a special bread traditionally made by housewives between the end of October and early November (around All Saints' Day) would slip into the wood-fired ovens after the regular bread was baked, leatting it cook slowly overnight. This bread contained seasonal ingredients: raisins and walnuts, in addition to salt, a little sugar, and quite a bit of pepper. The result was and is (at least with Aladino, while the vast majority of pastry shop overdo the sweetness, and thus distort the recipe) a bread that is well browned on the outside but soft inside, and an extremely enticing, not overly sweet flavor. 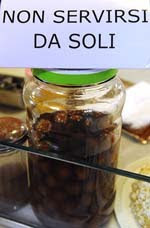 The sweetness of the raisins is balanced by the spicy pungency of the walnuts and over all the balance of salt and pepper creates a unique harmony. I could eat it by the ton! 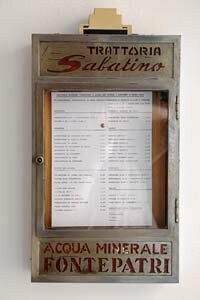 And then there are the other classic Sienese specialties such as ricciarelli or cavallucci (less well known but much, much better), the secrets of which Aladino learned when he apprenticed, at age 16, in the most classic Sienese pastry shop, Nannini's. Skipping over the rice budini (which we call "risotti") that one should instead dive into, I can't forget the rice fritters (those filled with pastry cream are to die for), and the cenci made during Carnival, or the chilled zuccotto that brightens my summer nights. 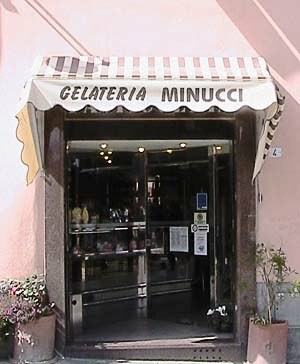 I have been to many pastry shops, but when I open the Minucci's door and hear Lidia's voice my mouth starts to water. Expectation, because you will eat well, and worry, because you will eat much more than you should, and the meal will take longer than you expect, both because of the conversation and because of the number of courses. The other thing Elisabetta likes to do is break out older vintages, and because of this, not only do you eat well, but you also learn something: We all know that Tuscan reds can age very well -- look at Brunello -- but few consider Tuscan whites to be ageworthy. A mistake, because they can perform most impressively if given time, and here Elisabetta is a pioneer, because she releases her wines when she thinks they're ready, not when those who only want whites bottled yesterday would prefer. In the course of this lunch, which Elisabetta held in January, we tasted current and older vintages of a number of her wines, and finished up with a Burgundy she happened to have. This had just been bottled; it's pale salmon pink paling to white at the rim, with some onionskin. The bouquet is quite fresh, with greenish vegetal notes and hints of gunflint supported by intense sea salt. Quite young, and very zesty. On the palate it's rich, with intense savory ripe but not overripe berry fruit supported by raspberry acidity and a gentle burr that has greenish notes of youth. Very pleasant, and will be nice as an aperitif in the immediate future, and be perfect in the summer months too, when you want something cool and refreshing. Elegant ambery gold with brilliant tawny reflections and greenish highlights. Elegant bouquet with honey and deft minerality supported by rather languid acidity and slight butterscotch. Very nice, in a hot weather key,a nd beautifully balanced. The palate reflects the nose, with deft honey-laced minerality supported by pleasant languidity and minerality. Great depth and elegance, and will drink very well with greens and salads, or light soups, or simple fish. It has a great deal to say and one would never guess its age. Lively brassy gold with amber highlights. The bouquet is rich, with vegetal notes and butterscotch supported by sea salt and some gunflint. Tremendous depth and elegance, with just the right amount of bitter acidity to provide direction and interest. On the palate it's extremely elegant, with bright minerality supported by savory acidity and some dusky tannins from grapes, flowing into a clean finish with lasting minerality and some bitterness. Beautiful, and a delightful expression of a cooler wetter vintage in which acidity comes more to the fore; it will bring greta joy to the table, and wiol drink very well with fish or white meats. Brassy gold with tawny greenish highlights. The bouquet is rich, with brambly honey and butterscotch supported by savory acidity and sea salt, It's clearly mature but very fresh, with lively savory lemon acidity and some bitter minerality with tannins as well, and flows into a clean bright finish with lively savory notes. A beautiful wine that has a great deal to say and is still very young, with the capacity to continue to climb for many more years. A fellow taster says the nose reminds him of fine Champagne. Deep tawny gold with golden reflections. Extraordinary nose with vegetal accents and dry hay mingled with sea salt, eucalyptus, hardwood ash, and bitter honey; it comes across as simpler than it is because of its harmony. On the palate it's rich and full, with bright lively acidity supported by greenish minerality and deft savory accents that flow into a long savory finish with some bitter notes, which gradually fade. Beautiful, and is one of those wines that you will remember for decades. Brassy gold with brilliant brassy reflections. the bouquet is rich and mineral, with deft hardwood ash and savory accents supported by gunflint and some sea salt. Very young, and very promising. On the palate it's deft and bright, with rich lemony minerality supported by clean bright savory tannins that flow into a clean savory finish. Beautiful and very pleasant to drink; it has great depth and if you want to seek facets you will find them, while your companions who are simply drinking the wine will drink it even faster. And it does have a considerable future, too. 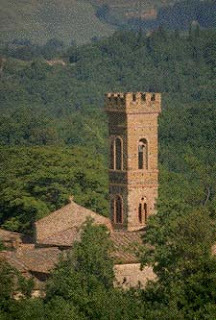 Il Garrulo is the traditional Chianti blend, with white grapes. This is unfiltered; it's lively pale ruby with black reflections and whitish rim, and has bright lively cherry fruit on the bouquet, supported by some graphite shavings and raspberry acidity. Quite fresh and still developing. On the palate it's bright, with lively cherry fruit supported by savory tannins that have a warm burr and flow into a clean savory berry fruit finish with underlying bitterness. Quite pleasant, and will be perfect with grilled meats fried meats, and will also work well with hearty pasta dishes and similar. Expect it to go quickly. This is something new, a Sangiovese in Purezza from the new vineyards planted on Triassic red earth soils, and it's still a work in progress (Elisabetta was able to procure barriques that are usually destined to Burgundy for it); production was low, in part because critters got into the vineyard and are much of the harvest, and Elisabetta has decided not to release this vintage. But it is quite promising: impenetrable pyrope with violet rim, and its darkness is also because it's unfiltered. The bouquet is elegant, with rich berry fruit supported by bramble and wet leaves with some tannic acidity, and underlying savory minerality, while a fellow taster finds fireplace, which can emerge in Sangiovese. Very young, and promising. On the palate it's full, rich, and quite mineral, with lively savory acidity and tannins that have a slight youthful greenish burr and flow into a long bright savory finish. It's a toddler stumbling about, but will be most impressive when it all comes together, in 3-5 years. This was made from Sangiovese and Malvasia nera, employing the Governo Toscano technique. It's rich almandine brick with brownish reflections and some brick in the rim. The bouquet is elegant, with rich leaf tobacco and underbrush supported by savory accents and wood smoke. Fully mature and beautiful to sniff. On the palate it's rich, with deft savory minerality supported by savory notes and sloightly leathery accents, with pleasant herbal overtones and savory tannins flowing into a clean savory finish. Tremendous depth and elegance, and it ahs a wonderful story to tell. A stunning expression of one of the great vintages of the second half of the last century. This is Sangiovese; it's black cherry ruby with cherry rim. The bouquet is quite elegant, with rich berry fruit supported by slight leathery notes and hints of smoke and fireplace, and underlying acidity and bramble. Fantastic depth and elegance, a wine that is quite young but that has a great deal to say. On the palate it's rich and full, with powerful berry fruit supported by lively berry fruit acidity and smooth dusky tannins that do have a youthful burr and flow into a clean savory sour cherry finish with underlying bitter accents. Beautiful though still very young, and though one could drink it now with a steak, it will very richly reward those blessed with patience. Brassy gold with greenish highlights. The bouquet is rich, with savory minerality and some spice and underlying vegetal accents shot with hints of butterscotch. Tremendous depth. On the palate it's ample, and fairly rich, with delicate languidity that flows into a clean rich, almost chewy finish. It's from an over-the-top vintage, and has a richness to it that derives form this. Quite pleasant, and will age well for another decade. This was from a cooler, wetter vintage; it's elegant brassy gold with brassy reflections, and has a powerful bouquet with rich savory minerality supported by deft bitterness and acidity with some butterscotch, and hints of petroleum too. It's extremely fresh, and quite beautiful. On the palate it's rich, powerful, and bright, with rich minerality supported by gunflint bitterness and butterscotch that flow into a clean rather bitter savory finish that lasts and lasts. Stunning, and a beautiful expression of the 02 vintage, which was horrible for reds in Tuscany, but much better for whites than people realize. This is a grand Cru de Bourgogne Cuvée Exceptionelle; it's elegant golden yellow with brilliant greenish highlights and brassy reflections. The bouquet is rich, with powerful gunflint and savory notes mingled with sea salt and some bitterness. Beautiful depth and elegance, and a joy to sniff. On the palate it's rich, with lively sour white berry fruit supported by clean sea salt, and bitterness with considerable minerality that has some sweetness woven into it, and flows into a clean savory finish with some bitterness. Quite elegant and with great depth, but with respect to the 2002 Carato it is coarser, and a fellow taster is more drastic, saying it's acidic and sweet. This is a judgment of today but does tell; I found the sweetness less problematic, but can see where he is coming from, because the sweetness does reduce finesse. Despite the improbable promise I made to myself to stay on a diet for at least a month, when my wife had a business meeting in Sulmona, I couldn't help but take advantage of the situation to attend a gastronomic event in nearby Rivisondoli. We're in the Abruzzo, close to a mile high, in what is known as the Cinque Miglia High Plains, but the road to reach the town, which serves as a base camp for many skiing enthusiasts, isn't at all difficult, except for the last stretch coming into town, if there is fresh snow on the ground. I had long wanted to sample Niko Romito's cooking: he is one of the new generation of chefs that are attracting considerable attention (we mentioned him in Identitá Golose 2007). 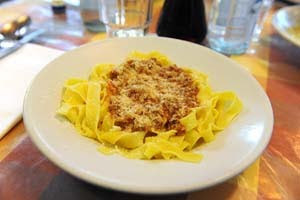 The Ristorante Reale is quite easy to find, but should you miss it, simply ask a local. Even the cats can give clear directions. 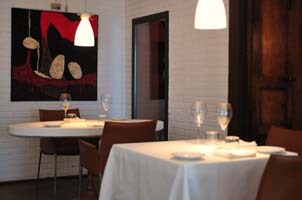 The restaurant is small, with a few tables, in a fairly sober modern setting enlivened by beautiful paintings that are an integral part of the décor, bringing warmth and reassurance. A young, well prepared team led by Cristiana, Niko's sister, will set you at ease, allowing you to relax an d open your senses to an array of aromas and flavors you will never forget. I don't want to take the time to list the awards and recognitions received by one of the luminaries of our cuisine (if you don't have a guidebook handy you will find many articles on the restaurant's site), also because I generally don't let them influence me, but rather think the direct approach is the only way to verify, in person, every aspect of something that, in cases like this, is certainly a "global" event. In these occasions my wife and I agree to taste different dishes so to increase our understanding of the restaurant, an understanding enhanced in this case by several entrees Niko proposed that enough by themselves to reveal his talent and gastronomic sensitivity. His cooking, while drawing from and working with the traditional local ingredients, follows paths whose borders are dictated exclusively by the measure, elegance, and taste of the pairings, and by the richness in flavor typical of the Abruzzo. Thus he reaches extraordinary heights with dishes that, in the past, would have found no place in the haute, let us call it that, bourgeois cuisine. For example, the incredible Assoluto di Cipolle, Parmigiano e Zafferano, a revelation for the senses, which is almost deceptive in its simple presentation and monochromatic appearance, but displays an extraordinary mixture of aromas and flavors. 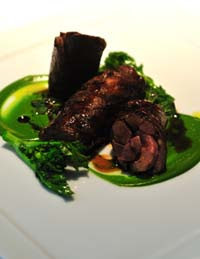 And what to say of Torcinello di Agnello Arrosto con Cime di Rapa? 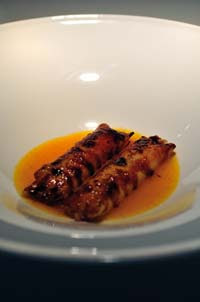 A splendid interpretation of a dish rooted, in various interpretations, in the Abruzzo, Molise, and the Foggiano, and whose composition (it's stuffed lamb's intestine) might raise doubts in those bothered by offal, doubts, let me assure you, that are completely unfounded because the dish offers a unique and satisfying experience. For want of space I must forgo descriptions of all the delights we enjoyed, but cannot not mention Cannelloncini Gratinati con Crema , Manarino and Vanilla, a dessert with a superb combination of flavors superbly prepared, that was enough to make me forget my dependence upon chocolate (a dependence assuaged by the confectionary that brought the meal to a c lose). The wine cellar is well managed, keeping the dishes featured on the menu in mind, with honest pricing that allows one to be more adventuresome in exploring the many local, national, and foreign wines. The Ristorante Reale will, I believe, be closing its doors in Rivisondoli within the end of the year, to reopen at a distance of 6 km, in Castel di Sangro, where for the past year they have been working on an ambitious project, Casadonna (the name of the facility), which will feature, in addition to the restaurant, a hotel and an ample center for gastronomic experimentation and research, a school of haute cuisine where Niko will help new talents to develop and shine. Each year he will select and work with 12 students, who will study the practical, cultural, scientific and creative aspects of cooking. To begin, the picture: Badia a Coltibuono is one of Chianti's historic estates, and though they do have a new winery complex that they inaugurated a couple of years ago, the botti are still in the cellars of the Badia, and quite beautiful. 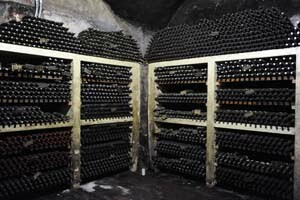 Equally impressive is their bottle archive, which begins with 1937 -- the occupying Germans drank everything older -- and continues to the present. Returning to wines, I have noted in the past that Badia a Coltibuono was one of the first estates to bottle Chianti Classico, but didn't know why until Emanuela Stucchi Prinetti took me to see their more southerly vineyards, about a half hour's drive from the Badia where they have their main offices: She told me her father, who studied engineering after being quite active in the resistance during the War, became a director of Minnesota Mining and Manufacturing (i.e. 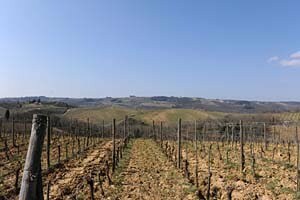 3M), and as a result had a much broader view of the world than most of the landowners in Chianti. 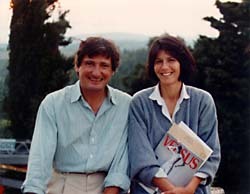 This led him to be one of the first to think about bottling and exporting the family's wines, and also to be one of the first to take stock of the changes that came with the end of the Mezzadria, the old tenant farming system that was one of the casualties of the post-war period and Italian industrialization. Badia a Coltibuono continues to be forward looking; it was one of the first major Tuscan estates to really believe in organic farming, and now all their top wines, those of the Badia A Coltibuono line, which are made from estate-grown grapes, are organically produced. Emanuela was pouring the new releases at the Chianti Classico Anteprima, but I was curious about how last year's wines -- what are currently on shelves in wine shops -- had developed, so she invited me to come taste. It was a beautiful day, perfect for a drive in the countryside, and I must say that the contrast between their vineyards and those of a neighboring estate that still uses defoliants to keep the ground cover between the rows of vines in check was rather stark. Deep cherry ruby with brilliant reflect ions and white rim. The bouquet is quite fresh, with violets and brambles mingled with succulent red berry fruit and some graphite shaving bitterness supported by brambly acidity and dappled shade. On the palate it's bright, and quite fresh, with lively cherry fruit supported by sour cherry acidity and some slightly leafy underbrush accents, and by tannins that are fairly smooth, but do have a bite to them, and flow into a clean slightly bitter sour cherry finish with some leafy undertones. Quite pleasant, and will drink nicely with pasta or hearty soups, and also has sufficient acidity and tannic structure for simple grilled meats and light stews. A smiling lark of a wine, and one that will go quickly. Prerelease sample; the wine will be released towards the end of the summer. Lively cherry ruby with violet accents and brilliant ruby reflections and white rim. The bouquet is fairly rich, with violets and berry fruit mingled with slight brambly acidity; it seems a little riper than the 08. On the palate it's medium bodied, and smooth, with fairly rich sour cherry fruit supported by soft sweet tannins and by slightly brambly acidity that flow into a clean rather brambly cherry fruit finish with underlying savory accents. It's slightly riper that the 2008, and also has slightly softer tannins, with less of a burr to them. This makes it a little more approachable than the 08 (we're talking slight degrees here), and a little less suited to fattier meats such as grilled sausages or lamb chops, both of which I would happily serve with the 08. Deep ruby with slight almandine accents and some orange towards the rim. The bouquet is elegant, with rich rather dusky cherry fruit supported by sour berry fruit acidity, a mixture of cherry and raspberry, and pleasant brambly accents as well, with some sea salt and hints of balsam thrown in. Quite welcoming, and pleasant to sniff in a rich, rather classic key. On the palate it's medium bodied tending towards full, with elegant sour cherry fruit supported by warm rather savory sour berry fruit acidity, and by warm tannins that have a dusky burr and flow into a long rather savory finish with lasting warmth and some peppery minerality as well. It's quite elegant, and is a wine that begs a substantial dish; it will work very well with hearty roasts or stews, ranging from leg of lamb though stewed boar or venison, and will also age nicely for a number of years, becoming lacy and ethereal with time. It's quite harmonious, and very nicely balanced. Cultus Boni differs somewhat from the rest of the line: It is intentionally a more polished, more approachable wine, a modern expression of Chianti, if you will. Not that it is without tradition: In addition to Sangiovese it contains Canaiolo -- the grape Baron Ricasoli used to temper his Sangiovese, and Colorino, a grape traditionally used to increase color. But it also has a little Merlot, which provides cheeky smoothness. Lively pigeon blood ruby that looks a little younger than the Riserva; there aren't the garnet accents. The bouquet is elegant, with rich smooth ripe cherry fruit supported by hints of cedar and some graphite shavings; continuing the comparison with the Riserva, it shows more polish and refinement; the Riserva is a bit scrappier. On the palate it's ample and quite smooth, with rich cherry fruit supported by slight brambly acidity and by smooth sweet tannins that flow into a clean dusky finish that has some cedary accents to it too, and continues at length. Quite pleasant in a more international key, and whereas I would suggest the Riserva if you like scrappier more aggressive wines, you will like this very much if you prefer wines that are smoother and more polished. 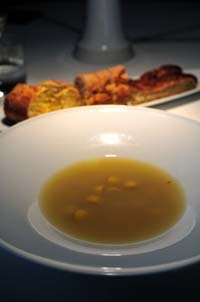 In terms of accompaniments, I would see it well with roast beef, cooked fairly rare and sliced fairly thick. Sangioveto was introduced in 1980, when Sangiovese was still a relatively unknown grape, with the express intention of drawing attention to the varietal. At the time Chianti Classico still required the addition of white grapes, so they labeled it Vino da Tavola, a classification in which it took its place along side Tignanello and Pergole Torte. Since then the regulations have changed, and now Chianti Classico can be 100% Sangiovese. But Chianti Classico's Disciplinare prohibits the use of grape names on the label, and therefore Sangioveto is an IGT. This is Sangiovese in Purezza, and was introduced to demonstrate the potential of Sangiovese (at a time that making a wine in Chianti from just Sangiovese was a revolutionary idea; Deep black cherry ruby with black reflections and cherry rim tending towards garnet. The bouquet is brooding, with fairly rich sour cherry fruit supported by brambles and some brambly acidity, with a fair amount of alcohol as well. It gives an impression of holding back, and though not young does come across as developing. On the palate it's quite elegant, with rich sour cherry fruit supported by savory notes and deft slightly brambly acidity, and by tannins that have a warm savory burr and flow into a long warm savory fruit laced finish. Quite graceful, and though one could drink it to great pleasure with a steak, it gives an impression of still having a ways to go; if you are blessed with patience in another 3-5 years it will reward you more than today. Deep pigeon blood ruby with black reflections and slightest hints of leathery garnet in the rim; it looks younger than the 06. On the palate it's deft, with brambly berry fruit supported by some savory notes; it's readier than the 06 but still coming together and quite nicely. On the palate it's quite elegant, and again readier than the 06, with fairly bright savory berry fruit supported by smooth tannins that do have a slight burr, and flow into a clean savory finish. Quick to write, but a very pleasant wine, and though it won't tower the way the 06 will in a few years, it will now and within 3-5 years bring considerable joy to a meal build around a porterhouse steak or leg of lamb. Quite approachable, with pleasant complexities to plumb, and you can expect the bottle to go quickly, which isn't what one normally says of a wine of this caliber. But here it's true. Tawny leathery amber with slight greenish reflections and dusky amber highlights. The bouquet is fairly intense, with sweetness mingled with dates and walnut skins, and some hints of Moroccan leather as well, and as it opens oatmeal with some brown sugar. Nice depth, in a slightly more reserved key than some. On the palate it's full, rich, and sweet, with powerful date and dried apricot sweetness supported by lively fairly mineral acidity that has some apricot accents, and by pleasant savory tannic notes that flow into a clean long sweet finish with, as the sweetness fades, hints of walnut skin, and slight bitter almond too. It's one of those wines you hate to pour out at a tasting: quite pleasant, and if you want to drink it at table I would drink it with aged cheeses. Otherwise, with friends far from the table. In addition to the wines, Badia a Coltibuono has a coking school, a very fine restaurant, and an agriturismo where one can stay. For information on all, check their website. San Gimignano's Vernaccia producers have continued with their custom of meeting with white wine producers from other regions, this time selecting the wines of Calce, a town in the Pyrenees whose wines are Vins de Pays des Cotes Catalanes, made with Grenache blanche and Greanche Gris, and Macabeu. I confess I am not familiar with the appellation, but the folks at the Consorzoio said they weren't either; rather, a winemaker happened to taste a wine from Calce and they decided to contact the appellation and went to visit. The region, which is surrounded by mountains, but is only about 15 km from the sea, has a very long tradition of winemaking, with vines, many of which are trained to what is essentially the Alberello or bush system, planted in stony parcels of land protected from the winds, which blow furiously, by stone fences. The appellation comprises about 400 hectares of vineyards at altitudes ranging mostly from 50 to 200 meters, though some sections reach much higher elevations, up to 6-700 m. There are three sets of soil conditions: a swath of schists, a swath of calcareous soils, and the a swath of marls. Brassy white with brilliant golden reflections. The bouquet is moderately intense and spicy with a fair amount of gunflint and mineral acidity supported by hints of gunpowder and slight smoke, with slight sour citrus as well that gains depth from just a hint of the mold that sometimes grows on oranges. Bracing and very fresh. On the palate it's bright, and fresh, with powerful minerality with sage and lemon essences, and underlying savoriness, supported by resinous accents that gain in intensity as the wine flows into the finish, which also has brambly, almost barky accents that emerge with time. It's a step in a very different direction (for me), but quite pleasant to drink, and will work very well with grilled or roasted fish, and will also work well with fried fish or meats and vegetables; because of its structure and the savoriness will work well with oriental dishes. Rich brassy gold with slight pinkish accents and brilliant brassy reflections. the bouquet is fairly intense, with savory sea salt mingled with sage and other herbs, some citric notes, and gunflint that gains in intensity as the wine opens. On the palate it's quite mineral, supported by lemony acidity and slight hints of resin -- not as powerful as those of the Horizon -- that flow into a clean mineral finish that gains depth from sour lemon acidity and is quite long. A zesty wine that is a little more polished than the Horizon, mostly because it's a year older, and will work very well with grilled or roasted fish, and would also be nice with creamy flavorful risotti or pasta dishes. A great deal of power and will age well too. And it gets better and better in the glass. Pale brassy white with slight pinkish overtones, and brilliant golden reflections. The bouquet is mineral with some acidity and as it opens granitic accents. Quite harmonious. On the palate it's more delicate than the first two, which are from calcareous soils, though from the same cloth, with savory minerality supported by acidity, and by a slight languidity that has something cheeky to it, and flows into a mineral finish with moderate acidity and some brambly accents. It's less extreme, and more approachable, and will drink well with grilled fish or roasted fish, and will drink quite quickly; because of its approachability it will work well with oriental foods as well. Deep, almost tawny brassy gold with some pinkish highlights and brilliant old gold reflections. The bouquet is elegant, with considerable granitic minerality and some tree bark, with slight bitterness, and hints of struck flint as well. Co9nsiderable harmony. On the palate it's full and rich, with bright lemony acidity and considerable granicic minerality that flows into a long, very mineral, rather tannic finish. They say 2005 was a hot vintage for them, but one wouldn't guess it; there's no ripe softness to it, and the gunflint and sea salt in the finish lasts and lasts. We are far removed from oaked whites of the new world here, and the wine displays tremendous character. If you like powerfully mineral wines that do their own thing, you will enjoy it. Pale brassy white with brassy reflections and white rim. The bouquet is fairly intense and quite fresh, with terrific minerality -- it's like sniffing crushed rocks -- supported by some mineral acidity and by hints of petroleum and beeswax (which are pleasant) as well, and heather as it opens. Quite harmonious and a great deal of depth, and very different from Horizon, which is the same vintage. On the palate it's elegant, with rich savory minerality supported by slight lemony accents and hints of resin and slight hazelnut skins that flow into a fairly long finish with savory mineral accents that lay a burr over the tongue, and slight hints of hazelnut. Quite elegant and quite approachable, and will drink very well with grilled or roasted fish, and also with fried fish or meats and fried vegetables. Quite pleasant, and if you like the style, with is unabashedly aggressive, you will enjoy it. Brassy gold with brilliant brassy reflections and slight pinkish overtones. The bouquet is frankly mineral, with with gunflint and crusjed rock supported by slight sea salt and some greenish vegetal accents, though the moinerality is what carries it. On the palate it's ample and rich, with elegant savory minerality laced with sour lemon and flows into a clean sour lemon finish, and though it's quick to write it's extremely essential, and displays tremendous harmony and depth. They say the French wine writers call this wine naked -- all the unessential is pared away -- and I can understand them, If -- as is the case with all of the wines of this appellation -- you like the style, you will enjoy it very, very much. Very impressive, and much more mineral and bracing than one would expect southern wines from hot dry areas to be. An eye-opening discovery. They are wines of tremendous character, and as such are demanding; they're not wines that will accept one's simply opening them while thinking about other things, but rather will demand and capture the attention of their drinkers. This was harvested a bit earlier than usual because 2009 was quite hot and the ripening was ahead of schedule, so to capture freshness he anticipated things. It's brassy white with brilliant brassy reflections and slight greenish highlights. The bouquet is fairly intense, with savory accents mingled with hops and citrus and some underlying sweetness. On the palate it's fairly direct, with bright brambly mineral acidity with some herbal accents that flows into a fairly bitter finish. Lively, and will drink well with grilled or fried fish. Mattia is from the same town in Lombardia as Giovanni Panizzi, and started out working with him before deciding to strike out on his own. This is his first vintage, and he said he prefer to harvest sooner rather than risk overripeness, and that he doesn't like malolactic fermentation. Pale brassy white with greenish overtones and brassy reflections. The bouquet is quite mineral, bringing to mind granite struck by a hammer, and though pleasant is fairly direct. On the palate it's savory, with honeydew melon and citrus fruit supported by citric acidity and some underlying bitterness, and flows into a clean bitter finish. It's pleasant, and very nice as a first vintage; the winery will be worth watching. Brilliant brassy white with brassy reflections. The bouquet is moderately intense, with butterscotch that may be from the yeasts mingled with pineapple; it's very different from Mattia's wine, also because they prefer to overripen their grapes, and the aroma cast is much riper. On the palate it's quite mineral -- minerality eclipses fruit -- with sea salt and underlying bitterness that becomes quite powerful as it flows into the finish. Deft, and a very different stylistic approach; if you like polished white it won't work for you because the mouth is more wild, but if you like the style you will enjoy it. Brassy greenish gold with golden reflections. The bouquet is rather languid, with butterscotch and lemon supported by some savory minerality; there's something fairly voluptuous about it. On the palate it's ample, with rich butterscotch laced minerality and lemony fruit -- though the minerality overshadows -- that flows into a fairly long peppery finish with slight butterscotch overtones. Minerlaity in spades, and it's a well made wine; if you like the style, which revolves around ripeness and deft oak use -- not overuse -- you will enjoy it very much, though you shouldn't expect one of those butterscotch laced new world oaked wines. This is their first vintage, from a vineyard planted in 1999. Pale brassy white with slight greenish reflections. The bouquet is muted, though swishing brings up some minerality and slight sage and vegetal accents with underlying sea salts. On the palate it's bright, with lively lemony acidity supported by some minerality and by slight greenish accents that flow into a fairly long sour finish with some bitter mineral accents. It's quite pleasant, in a brash and rather aggressive key, and will drink very well with grilled meats or fish, and will also age well for many more years. A convincing first vintage. Giovanni, who was a fixture in the Consorzio and also its president for a time, left us this year, and it seemed a bit funny not to see him standing at the head of the hall. But we had his wine, I could almost see his slightly lopsided grin. It's lively greenish gold with brilliant greenish reflections. The bouquet is powerful, and elegant, with butterscotch-laced citric accents and some savory notes, and also some alcohol. Quite pleasant to sniff. On the palate it's ample, with rich butterscotch laced lemony fruit supported by slight vegetal bitterness that flows into a clean savory finish with slight butterscotch accents. Beautiful, and though it does have a slightly different feel to it -- the wood use reflects the stylistic preferences of the time -- it has a great deal to say, and is a wine with things even the more traditionally minded among us will find to ponder. Calce's wines displayed tremendous character. So did San Gimignano's, though in a different way, and I was quite impressed by their decision to present wineries that are barely out of the starting blocks, but already doing interesting things. They only underline Vernaccia's potential, while the 2006 also brings up another point, that Vernaccia is much better suited to aging than many people give it credit for, and if consumers had the patience to give it a year or two (or more) in bottle, it would richly reward them. After the morning session the winemakers presented their wines, and this year there was also a tasting room for those who wanted to taste in a more structured setting. I tasted a mixture, some wines from winemakers I know and others from winemakers who are unfamiliar to me. An important thing to keep in mind is that these wines -- unlike those presented in the morning session -- had just been bottled, and are therefore still coming together. 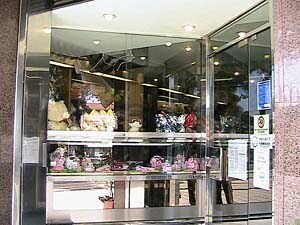 The impressions should therefore be taken with beneficio d'inventario, i.e. advisedly. I am planning to taste through everything towards summer, when the wines have a little more bottle age. Pale brassy yellow with brilliant brassy reflections and white rim. The bouquet is young, and floral, with white blossoms and hints of almonds mingled with minerality and some lemony accents as well. Nice balance and quite fresh. On the palate it's bright and rich, with lively lemony fruit supported by clean savory lemony acidity and some bitterness that flow into a fairly tart finish with underlying bitterness. Pleasant in a fresh, saucy bracing sort of key, and will drink quite well with grilled or roasted fish and will be perfect at a cookout by the sea; thanks to its lively acidity it will also work well with fried fish or meats. Simple, and fun, and if you like the style you will enjoy it very much. Pale brassy yellow with greenish highlights and brilliant brassy reflections; it's just a hint cloudy. The bouquet is intense, and fairly vegetal, with bitter minerality as well, and some bitter almonds, and also slight honey. An interesting combination. On the palate it's fairly full, and rather languid, with ample greenish lemony fruit and acidity supported by bitter accents and some savory notes that flow into a long bitter sour lemon finish that gains depth from savory accents and peppery spice. It's pleasant, in a vigorous way, and will drink nicely with rich fish or vegetable based pasta dishes or risotti, and also with grilled or roasted fish, and with white meats. Quite powerful, and has the capacity to age well for several years. Fairly deep brassy yellow with brilliant brassy reflections and white rim. The bouquet is powerful, with a fairly intense shot of butterscotch laced with pungency and some bitter spice; it's oaked and the oak is at present overshadowing fruit, though this is in part youth. On the palate it's fairly rich, with lively lemony fruit on the outset, which surrenders to a bitter rather savory oaky veneer that flows out and covers it, flowing into a rather bitter finish with some sour lemon accents. It needs time, at least a year, to come together and balance out. Pale brassy greenish gold with brilliant brassy reflections and white rim. The bouquet is rich for a just-bottled wine, and savory, with some minerality and some lemony citric acidity and slight underlying brambly bitterness. On the palate it's medium bodied in a pleasantly vegetal way, with artichoke greenness, and bright mineral acidity and a savory rather bitter burr that flows into a clean bitter finish with lasting savory accents. It's pleasant in a brash and direct sort of way, and will drink well with vegetable based risotti and pasta sauces, and fish dishes. Expect it to go quickly. Lively brassy gold with greenish highlights and brassy reflections. The bouquet is fairly intense, with deft spicy butterscotch and warm citric accents supported by some vegetal notes and slight gunflint. On the palate it's ample, with fairly rich decidedly vegetal lemon fruit, a cross between lemons and artichoke almost, supported by bitterness and mineral acidity that flow into a greenish finish. It's still coming together and needs another 6-8 months for the nose to develop, but is promising nicely It will be pleasant with flavorful fish based first course dishes, including fish stew/soups such as cacciucco, and will also be nice with grilled or roasted fish, or succulent white meats. A tank sample; it's cloudy yellow with brassy reflections. The bouquet is fresh and rich and in the air, with fairly bright hops (of the kind used to make beer) and greenish spice mingled with alcohol and gunflint. On the palate it's full and rather languid, with fairly rich sour lemon fruit supported by minerality and sour lemon acidity that flows into a long sour lemon finish that has intriguing salty accents, like salt crystals bursting on the tongue. It will be pleasant in a rather voluptuous, fairly international key. Brilliant brassy yellow with brassy reflections and white rim. The bouquet is powerful, with fairly intense dusky butterscotch supported by vegetal and citric accents and by some spice; it shows nice polish in a fairly international key. On the palate it's full and languid, with rich soft lemony fruit supported by lemony acidity that honeysuckle had its corners buffed smooth, and by some cedary almost pencil shaving savory bitterness that gradually emerges in the finish and carries at length, accompanying the lemon as it fades into savory bitterness. Pleasant and approachable in an international key, and if you like white wines that have felt a touch of wood you will like it. If you are instead less in favor of oak you will like it less, though it is and will remain quite approachable. Pale brassy white with brassy reflections. the bouquet is fairly intense, and mineral, with gunflint and some vegetal accents at the outset that are joined by the heather of a Tuscan field and mingle with savory notes and slight spice. Refreshing. On the palate it's mineral, with savory bitter sour lemon acidity that flows into a greenish bitter finish with some alcoholic warmth. It's more bitter than acidic and also quite mineral, and is a bit less approachable than some; if you like soft smooth whites it won't work as well, but you will enjoy it if you prefer more aggressive wines. Lively brassy yellow with brassy reflections and white rim. The bouquet is moderately intense, with greenish vegetal accents mingled with some pungency and brambly accents. It's still coming together. On the palate it's ample and decidedly bitter with lively almost artichoke bitter vegetal accents and sour lemon fruit supported by some savoriness and brambly tannins from grapes that flow into a fairly long bitter finish. It's pleasant, in a bitter key, and will drink well with hearty fish or white meats, and will age nicely for several years. Pale brassy yellow with greenish reflections. The bouquet is eye opening and gives an impression of softness, like sinking into a feather pillow, with floral accents and hints of bitter almonds, and some underlying sweetness as well, and as it opens some gunflint. It's atypical with respect to the other wines tasted. On the palate it's ample, with moderately intense lemony fruit that is supported by and then gives way to savory bitterness that carries into a long savory bitter finish. It's approachable in a richer and rather softer key, though it does display the savory bitterness typical of Vernaccia, and will be a good bet if you prefer whites that are little softer. Brassy white with brilliant brassy reflections and white rim. The bouquet is quite pleasant, with heather and some hints of bitter almonds mingled with minerality and some white blossoms. Beautiful depth and considerable finesse. On the palate it's bright, with rich mineral-laced lemony fruit supported by gunflint bitterness and some savory accents that lead into a fairly long clean bright mineral finish. Very pleasant, and will drink quite well with fish or white meats now, and also has the capacity to age well for a 5-8 years. Will be worth seeking out. Brassy gold with brassy highlights. The bouquet is still developing, though swishing brings up some bitter accents and some gunflint. Minerality in the making. On the palate it's fairly rich, with bright minerality that's pleasantly full and supported by slight bitterness, which is not as intense as it was in many of the other wines tasted, and by some peppery spice with mineral acidity providing direction. It's pleasant and approachable, in a softer key because there is minerality and spice from grape, but not the intense bitterness some of the other wines display. It made me think, and this is a good thing. It is also clearly developing, and will I think go interesting places. Pale brassy yellow with greenish reflections and brilliant brassy highlights. The bouquet is still coming together, with fairly bright minerality supported by some bitterness and slight vegetal accents, in particular artichoke leaves, and some underlying citric acidity. On the palate it's bright, with rather languid lemony acidity and fruit supported by some dusky greenish bitter vegetal accents, and by slight peppery spice that flow into a bright savory finish with mineral and citric accents. Pleasant, in a powerful key, though it needs another year to come together, and will at that point be quite pleasant with flavorful fish or white meats. Pale brassy white with slight greenish highlights and brilliant brassy reflections. The bouquet is fairly intense with floral accents and some greenish notes, and slight lemony fruit as well, and a fair amount of alcohol too. Quite approachable in a direct, rather up-front key. On the palate it's ample, with moderately intense bitter mineral laced lemony fruit supported by some savory accents that gradually fade into bitter warmth. It's direct and up front, a wine that is not long on complexity but that will work nicely with what it's served with, not demanding center stage, and will be fairly versatile because it's neither strongly mineral nor tremendously acididic. It will also work well with Chinese. Bright brassy gold with brilliant brassy reflections. The bouquet is intense and greenish, with almond fuzz and some vegetal accents supported by savory minerality and some gunflint as well. On the palate it's fairly rich, with lively minerality supported by mineral acidity and some gunflint bitterness, that flow into a clean rather savory finish that resolved into almost peppery spice. It's deft, and fairly agile, and will drink nicely with grilled or roasted fish, and also with white meats. Pleasant and if you like the style you will enjoy it. Pale brassy yellow with bright brassy reflections. The bouquet is smoky, with airy bitterness as well mingled with quite a bit of gunflint and some mineral acidity. On the palate it's ample, and more citric than I might have expected, with lemony fruit supported by lemony acidity and dusky bitterness that flow together into a fairly long bitter finish that does have some hints of loquat to it. Pleasant, and quite approachable; it will drink well with fish or vegetable based risotti and pasta dishes, and will also drink nicely with grilled or roasted fish, and with white meats, while there is enough acidity for it to work well with fried fish or meats and vegetables. In short, versatile. Pale brassy yellow with greenish highlights. The bouquet is muted, though swishing brings up floral accents and some lemon mingled with sea salt and slight butterscotch. It needs time. On the palate it's ample, with moderately intense lemony fruit supported by savory minerality and peppery bitterness that flows into a spicy bitter finish. It's quite approachable, and also fairly direct, and will drink well with flavorful fish or white meats, and also will work well with fried meats or fish because it dies have a fair charge of peppery acidity to it. Tenute Guicciardini Strozzi Cusona 1933 Vernaccia di San Gimignano DOCG 2009 Pale brassy yellow with brilliant brassy reflections. The bouquet is fairly intense in a greenish key, with herbal notes and hints of artichoke leaves mingled with gunflint and some bramble and tree bark. It's quite young but shows promise. On the palate it's ample and soft, with less acidity than I had expected; there's fairly bright lemony fruit supported by brambly minerality more than acidity, that flows into a smooth citric finish with a discreet vegetal underpinning. It's pleasant, in a less aggressive way, and if your preference is for white wine that are not oaked -- no butterscotch here -- but are also not aggressively acidic, but with enough acidity for good direction, you will enjoy it. It will drink nicely with the rich pasta dishes (perhaps not meat sauces, but many others) and risotti, as well as the obvious fish from the oven or grill, and also with creamy white meats. My overall impression was that the 2010 seems to be a good vintage, with lively minerality and considerable life. Should be nice. The day after the Amarone Anteprima, the Consorzio organized several tours through the region for those who had come to the presentation, and I joined Michelle Shah and several other English-speaking journalists. 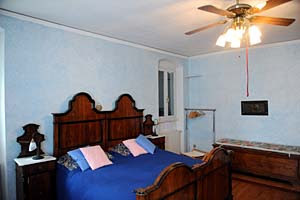 Our first stop was Villa Monteleone, which is in the town of Gargagnago. 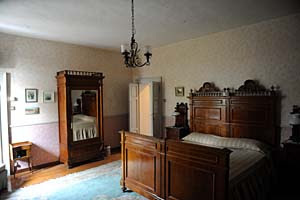 The place is quite beautiful, and in addition to making wines they operate a bed & breakfast with very nice rooms, a couple of which are pictured here. In short, you could well go for the wines and stay on to explore the area. 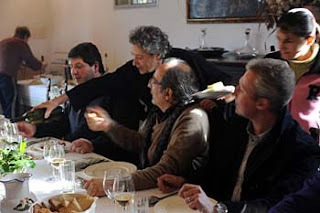 Raffaele Bovo, their cellarmaster and agronomist, said, in the course of showing us around, that the varietal breakdown of the wines is roughly 70% Corvina, 20% Corvinone, and 5% each Rondinella and Molinara. The Amarone has relatively more Corvina and Corvinone, though the varietals are mixed in the vineyards, and this makes separating them out more difficult. Of their production, about 85% is exported. Ferments in steel, and ages 6 months in bottle. Lively cherry ruby with pink rim. The bouquet is bright and fresh, with rich sour cherries supported by brambly acidity and savory notes, also some underbrush and greenish vegetal accents. Bright, with hints of dappled shade. On the palate it's fairly rich, with nice red berry fruit supported by moderate acidity and by tannins that seem a little dry when drunk by itself, but that will work nicely to balance something such as pasta with a meat sauce or succulent burgers. The finish is pleasantly fruity with some vegetal accents, and you could well want a second bottle. 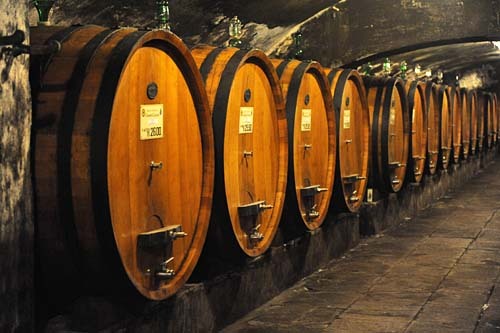 This is a ripasso; the wine spends 4-5 days on the lees of the Amarone -- not longer because the seeds can give off less good aromas if the riapssata is overdone. Lively cherry ruby with black reflections. The bouquet is fairly intense, with sour cherries supported by greenish sandalwood and pleasant spice with slight jammy accents. Nice balance and pleasant to sniff; it opens nicely gaining intensity of both fruit and spice, hints nutmeg and mace. On the palate it's pleasant, with fairly rich cherry fruit supported by tannins that have pleasing bitter accents and a slight burr that flows into a clean slightly greenish finish. Pleasant, and will work very well with hearty stews and succulent roasts, but needs another year or two to get its bearings and smooth. I would expect it to age well for 5-8 years. Deep cherry ruby with bright black reflections. The bouquet is fairly rich, and bright for a 2007, with cherry fruit that has some prune accents supported by some brown sugar and hints of sandalwood with underlying hints of jamminess. On the palate it's ample and rich, with powerful cherry plum fruit supported by moderate acidity and clean fairly sweet tannins that have slight bitter accents and a slight burr that will smooth in with time; the finish is fairly sweet and fairly long with some bitter accents. Pleasant, and will drink nicely with succulent stews or boiled meats now, though it will reward those who have some patience. Deep ruby with almandine rim. The bouquet is fairly rich, with brighter cherry fruit (now) than the 07, with berry fruit supported by brambly accents and sandalwood, with hints of cumin and sea salt too. Considerable complexity On the palate it's rich, with elegant red berry fruit supported by deft acidity and some brown sugar sweetness, with tannins that are a touch drier than they might be in a better vintage, with some hints of vanilla as well, and flows into a clean slightly sour finish. Very pleasant in an obviously lesser, cooler wetter vintage key: with respect to a better vintage it's thinner and lighter, but is a very fine expression of the 05. This spends three years in wood before bottling, during which time they watch it closely because it is want to referment. Deep black almandine with black reflections. The bouquet is elegant, and a bit less sweet than some, with bitter accents mingled into the sweetness, brown sugar, some vegetal notes, hints of green squash (which sounds odd but works very well), dates and dried fruit, and opens beautifully, growing and gaining in complexity. On the palate it's rich, with elegant plum cherry fruit supported by deft acidity and smooth sweet tannins that flow into a rich, sweet finish. Beautiful wine, and the perfect thing to open with (good) friends far from the table, and will work very well with cheeses too. Villa Monteleone Recioto della Valpolicella 2005 Deep black almandine with black reflections and almandine in the rim. The bouquet is elegant, with cantaloupe and hints of sandalwood on the outset, followed by elegant fried fruit and underlying sweetness. Quite pleasant to sniff, and beautiful depth. On the palate it's very rich, with elegant cherry fruit, supported by deft cedar that is a bit more apparent than in the 04, though this is also because it's a year younger, and flows into a long sweet berry fruit finish. Beautiful, and most impressive, with some sandalwood spice in the finish as well. When I first moved to Florence in 1982 I was a student, and like most students, lived on a shoestring budget. Which means I didn't eat out often. And would have eaten out considerably less than I did had it not been for the Trattoria Sabatino, an elongate hole in the wall in Borgo San Frediano, whose walls were an improbable glossy pea green, while the floor, I remember, was of uneven terracotta and the window in the back was rather small. But it was open day and night on weekdays, and Valerio and Laura, who took care of the serving, always greeted me (and everyone else) with a smile, and ushered me to a place. As I said, a place; if the trattoria was already full you could find yourself sitting next to an old-age pensioner, someone from a nearby office, or a traveler from much further away. It added a touch of adventure, and I had many interesting conversations. The cooking? 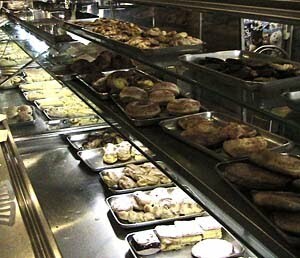 Casalingo, which in Italian means home cooking, and in restaurants often means local cooking with chefly touches that may introduce creative variations (some brilliant and others odd), and generally includes oversight and attention to presentation that go beyond what you'll find in a home. 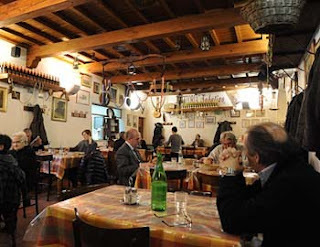 Not at Sabatino's; here the cucina casalingo was the real deal, of the sort that some of the old age pensioners and locals could likely have just as easily cooked up at home, except if they had they'd have had to cook, and wouldn't have enjoyed the banter in the trattoria. The place had a lived in feel, and for many was a second home. And had been for a while; it was founded in 1956, by Sabatino and Fidalma Buccioni, who realized they couldn't go it alone, and drafted the help of other family members, in particular their 12-year old son Valerio, who quit school and began to wait tables and do whatever else was necessary while his parents worked in the kitchen. Florence was very different then, with (for many) a slower pace of life, and they stayed open afternoons, with the many of the patrons who had finished their meals staying on to play cards, talk and drink wine. With time Valerio met Laura, the two married, and she joined him in helping serve their patrons. 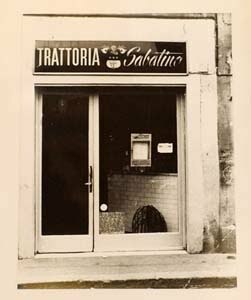 And life at the trattoria continued to follow the ebb and flow of life in Florence, both good and bad; in November 1966 they watched with helpless frustration from their apartment above the trattoria as the flood waters raced down the street; when they receded the bandone (the hinged metal shutters of the storefront) was stove in, but Sabatino managed to lift them, to devastation and ruin -- the waters had risen almost to the ceiling, and they found their two cats cowering on one of the high shelves where they put their wine bottles. It took them two weeks to dig out, during which time many of their suppliers brought them -- by boat, because the roads were impassable -- food and other necessities, including a demijohn of drinking water. When they reopened, the 16th day after the flood, there were 6 inches of sawdust on the floor to absorb the mud the patrons tracked in. And so life continued, with Valerio and Laura's daughters (whom I recall coming in after school in the 80s) joining them, Ilaria in the hall and Letizia in the kitchen, until a sad day in 1998, when the landlords decided not to renew their lease -- people protested, and the city government met (and ate) in the trattoria, but to no avail: Sabatino closed, to be replaced by a laundrymat. Fortunately Valerio had somewhere to store their things, because they soon found a new place, one that is considerably larger and airier, in Via Pisana next to the Porta San Frediano. Painting -- there is still green on the walls, though not as much -- hanging the menu box (the menus are still typed up daily on a manual typewriter) outside the door, placing the Bancone da Mescita (the marble bar from which they once sold wine) by the entrance, arranging their tables and chairs, remounting the shelves, which aren't quite as high as they used to be and putting new bottles of wine on them, and all of their old clients came hurrying home. To enjoy the same dishes they always have, simple soups and pasta al sugo or al pomodoro, a variety of roasts including be ef (with potatoes), veal, pork, chicken, and guinea hen, steak, if you want it, fish on Fridays, seasonal vegetables, cheese, and seasonal desserts -- the last time I went was Carnevale, and there were cenci and schiacciata alla fiorentina. And a jar of brandied cherries on the bancone, with a sign saying "don't help yourself," because people did. The wheel of life continues to turn; Ilaria has married Massimo, who waits tables with her, while their daughters, who are still little, will soon begin to stop by after school. A slice of one of the old Florentine neighborhoods as it once was, and that I hope will never change. The Photo Of The Week: Garibaldi! 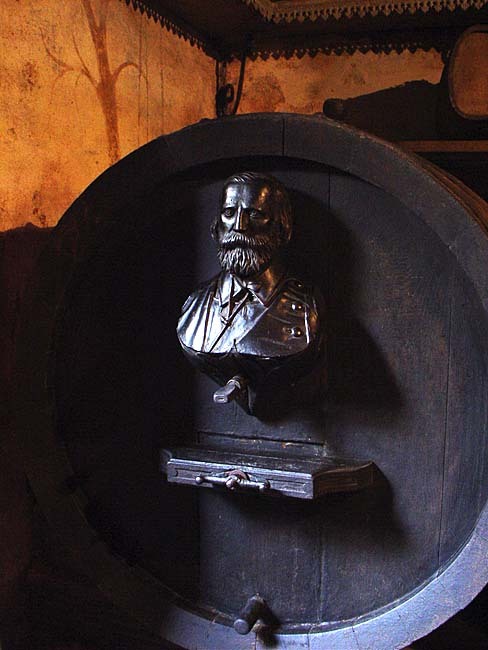 This week Italy celebrates its 150th anniversary as a nation, so it seems fitting to weigh in with a bust of Garibaldi, on a botte in the cellar of Alma Vairetto, in Carema (northern Piemonte). 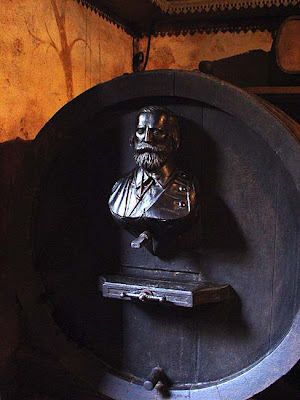 They no longer use this cellar to store wine, but if you visit Carema they will open it upon request, and you'll find many other personages besides Garibaldi. Paolo de Marchi of Isole e Olena was one of those presenting barrel samples at the Chianti Classico Anteprima this year, and to be quite honest I am not a tremendous fan of barrel samples -- they offer a preview of what the wine is likely to be, but are far from being definitive. So Paolo and I got out our cellphones, consulted the calendars, and decided to meet later, and taste through more than just the new Chianti Classico. Later was yesterday; it was a pretty day and a nice drive on country lanes (the road to Isole is now paved), and when I arrived Paolo had set out current and past vintages of the wines he makes in Tuscany, and the current vintages of the wines he and his son Luca make at Proprietà Sperino in northern Piemonte. I took advantage of his having set out several 2006 vintages to compare them with other vintages of the same wine, and also quite enjoyed the quick vertical of the his Chianti Classico D'Annata. Since I was tasting in Italy, the bottles I tasted were all sealed with corks. Paolo, like many Italian winemakers, is not happy with corks -- they're expensive and cork taint is a serious and growing problem -- but the regulations in Italy (and consumers) almost invariably demand cork. Elsewhere consumers and governing bodies are more open to innovation, and if you purchase his IGT wines outside of Italy, in particular his Chardonnay and his Cepparello, you may find them with screw caps. I tasted his cork and screw cap Cardonnay side-by-side in 2009 and found the screw cap wine to be fresher and crisper, and scored it slightly higher. Paolo says he has noted the same thing with Cepparello in screw cap bottles, which offer the additional bonus of being completely free of corkage problems. Collezione De Marchi Chardonnay IGT Toscana 2009 Pale brassy greenish gold with brilliant greenish reflections. The bouquet is rich, with elegant greenish butterscotch supported by deft savory minerality and spice, and underlying dappled shade. Beautiful definition and control. On the palate it's full and rich, with slightly languid tropical fruit laced minerality supported by mineral acidity that gradually revolves into citric as the wine flows into the finish, which also has a long mineral undercurrent. Quite beautiful; it has the lithe firm grace of a dancer, and is one of those wines that you open, and secretly want to keep for yourself. The vineyards are more than 20 years old, and fully express their potential in a way that they didn't quite in the past. Well worth seeking out. Elegant cherry ruby with black reflections and cherry rim. The bouquet is deft, with dusky cherry fruit that has some jammy cherry overtones and is supported by deft slightly brambly acidity and pleasingly vibrant spice; it's very much alive in a smiling key. On the palate it's medium bodied, with rich cherry fruit supported by dusky bitterness and pleasing mineral acidity, while the tannins are rich, and have a slight dusky burr that lows into a long dusky cherry fruit finish. It's quite elegant, in a slightly more brooding key -- this is a characteristic of the vintage -- on the palate than the nose, and will work very well with grilled meats or roasts, and you will find yourself wondering where it went. A second bottle is definitely in order. Deep black cherry ruby with black reflections; it's slightly darker than the 2007. The bouquet is rich, with deft sour cherry fruit supported by some berry fruit acidity and pleasant minerality with hints, of iodine and some graphite shaving bitterness. Quick to write, but quite harmonious and quite pleasant to sniff. On the palate it's graceful, with rich rather dusky cherry fruit supported by deft berry fruit acidity and smooth sweet tannins that flow into a long cherry laced finish with a deft tannic underpinning that has a slight burr, and continues at length, gaining definition from pleasant savory minerality. Very nice, coupling approachable elegance with considerable finesse, and it will drink very well with grilled red meats or light stews, and also with roasts, though I would think more in terms of roast beef cooked rare than leg of lamb. Expect the bottle to go quickly, and you will want another. This is a barrel sample; it's elegant cherry ruby with black reflections and hints of violet that carry into a violet rim. The bouquet is fairly rich, with jammy cherry fruit supported by some violets and graphite shaving bitterness with some underlying brambly acidity. Promising. On the palate it's medium bodied, with rich cherry fruit that has slight sweetish jammy accents supported by deft acidity and slight nutmeg spice, and by smooth sweet tannins -- there is a burr, which is understandable given their youth -- that flow into a clean slightly bitter cherry finish. Very promising, and will be worth waiting for. It's a little riper than either the 07 or the 08, and this is due to the vagaries of the vintage. Deep black cherry ruby with black reflections and some almandine towards the rim. The bouquet is elegant, with deft sour cherry fruit supported by some slightly balsamic spice and very slight cedar that doesn't impinge, but whose absence would be noted, and by deft minerality with fairly rich sea salt as well. Great finesse and harmony; it's one of those wines you can sniff, and sniff again, and suddenly realize you are ignoring everything else in the room. On the palate it's rich, with elegant slightly sour cherry fruit supported by deft mineral acidity with some graphite bitterness, and by tannins that have hints of cedar to them and flow into a clean slightly bitter cherry laced finish. It's very elegant, but has a certain austere hardness to it, like a pretty girl wearing a suite of armor (we have the new Alice in Wonderland dvd), and is not the most user friendly wine I've had. However, if you are willing to give it time and space, and attention -- it's like those rare, infuriating people who are full of themselves but have the right to be so -- it has a great deal to say and will only have more in coming years. If you instead want to just drink it, it will be superb with a Porterhouse steak. In short, it's a wine that can be approached at many levels. If I were lucky enough to have a case, I would enjoy a bottle or two now, with wine-loving friends, and put the rest away for posterity, or close to it. Slightly darker and brighter black cherry ruby, and this is due to greater youth. The bouquet is more approachable, with enticing slightly jammy cherry and forest berry fruit supported by hints of chocolate and some underlying spice; like the 2006 it's extremely harmonious, but is a little more luscious. And, like the 2006, it will capture your attention. On the palate it's medium bodied, with deft cherry fruit supported by delicate sour cherry acidity and smooth sweet tannins that flow into a long, delicate cherry finish that lasts and lasts. A beautiful wine that ahs a great deal to say, and that will work superbly with a steak or an elegant roast; I would be tempted to think of a Gran Pezzo, or crown roast, though it will also make a leg of lamb extremely memorable. By comparison with the 06 it is a bit more approachable, and doesn't have that feeling of distance and austerity; this means that it is a bit easier to drink, and may capture the attention of non-wine geeks in a way that the 06 likely won't. If this sounds like a back handed compliment it isn't meant to be so; simply the 07 is a wine I would open with any friend, whereas the 06 I would reserve for a select few, and also give it time. The 07 is readier now, and though it will age very well is not, I think, going to be as long lived as the 06. Impenetrable black cherry ruby with black reflections and cherry rim. The bouquet is rich, with deft cherry fruit supported by delicate underbrush and some jammy accents, with slight wet leaves and wet bark as well. Quite harmonious -- I've been using that word a lot -- and with considerable depth. On the palate it's full, with rich, languid cherry fruit supported by mineral acidity and slight underbrush bitterness, while the tannins are smooth and sweet. If it were younger one would be tempted to write about larks, but this is richer and has more substance; it's a beautiful expression of Syrah as it comes form Tuscany when the vineyard is mature, with a delicacy that the more aggressive Tuscan varietals don't display. Not that's it's soft, because there is acidity to provide direction, but it's a touch more languid. And very, very nice. One could get used to it, and then where would one be? Impenetrable black cherry ruby with black reflections and cherry rim. The bouquet is powerful, with slightly more underbrush than the 0f, and also slightly duskier there's also berry fruit and savory accents, but it has a more distant feel to it. Quite elegant, in a slightly more reserved key. On the palate it's full, with rich cherry and berry fruit supported by underbrush laced mineral acidity and by tannins that have some hints of underbrush to them, and flow into a slightly more dusky finish than that displayed by the 04. Very nice, in a more austere key than the 04, and in this it resembles the relationship between the 06 and 07 Cepparello; this wine has the same sort of distance -- perhaps to a greater degree -- as the 06 Cepparello, and is a wine that one could drink now with a steak, but that will reward those with patience, and in any case demands attention. It's a wine I would break out with wine loving friends, and probably sip in silence (mine and theirs), whereas the 04 is something that will capture most anyone. Impenetrable leathery black cherry ruby with pigeon blood ruby rim. Impressive and no hints of garnet at all. The bouquet is powerful, with rich black currant fruit with ints of ripe blackberry, and cherry fruit as well supported by deft spice and nicely balanced by hints of cedar and slight balsamic accents, while there are underlying hints of blackberry jam, the home made kind that has whole blackberries in the jar. Tremendous harmony, and is -- once again -- a wine that will capture your attention and have you ignoring everything else in the vicinity. On the palate it's full, with rich black currant and blackberry fruit supported by deft mineral acidity and by tannins that have a warm burr that brings wet tree bark to mind -- and this is a very nice thing -- and flows into a very long berry fruit finish with deft tannic underpinning. Extraordinary depth and finesse, and though I could continue with superlatives, I will quit while I'm ahead. It will drink beautifully now with succulent roasts -- a crown roast would be perfect, and leg of lamb too -- now, and also age beautifully almost indefinitely. This is what Cabernet should be all about. Like all wine writers, I have tasted my share of Cabernet, and can't recall any that would come close to eclipsing it. Tawny amber with brilliant apricot reflections and greenish tawny amber accents towards the rim. The bouquet is enticing, with dates and dried figs mingled with considerable sweetness and slight walnut skin; there's a little less acidity than in some years, and this is thanks to the long hot 2003 summer. On the palate it's full and quite sweet, with delicate date and dried fig st supported by warmth more than acidity tout court, which flows into a long deft date fruit finish that has some almost crystalline sugar to it, and lasting warmth. While this is quick to write, there's considerable depth in a somewhat softer key than usual -- the long hot summer did influence the grapes -- and it's a wine that will drink very well with green cheeses. Perhaps not aggressive Roquefort, but somewhat milder variations on the theme, for example Gorgonzola Dolce or some of the English Stiltons. Cheddar, too. Proprietà Sperino Uvaggio Coste della Sesia Rosso DOC 2007 This is a blend of Nebbiolo, Vespolina, and Croatina; it's lively almandine ruby with black reflections and almandine rim. The bouquet is elegant, with rich slightly greenish wild flowers supported by savory notes, berry fruit and lively sour berry fruit acidity again laced with greenish accents and spice. It's a tomboy in a glass, and a smiling one at that. On the palate it's medium bodied, with rich sour cherry fruit supported by savory minerality and by tannins that have a warm savory burr with hints of bramble, and flow into a clean brambly sour cherry finish with lasting warmth. Quite elegant, in a rather feisty key; if you like the smooth softness of a ripe Merlot you will find it too aggressive, but if you prefer livelier wines it will do spectacularly with a platter of mixed grilled meats, and work nicely with roasts or a hearty stews too. So9me might say it is too much for a cookout, but if I were putting lamb chops and steak on the grill I would be very happy with this wine, and it would also be a nice bet with fried meats, especially lamb chops. This is Nebbiolo, with a little Vespolina. It's Elegant garnet with black reflections and garnet ruby highlights, while there is dusky garnet in the rim. The bouquet is deft, with savory cherry fruit supported by slight rosa canina and some elegant, almost brambly minerality, and the greenish vegetal accents that Nebbiolo from Northern Piemonte often displays. Considerable harmony and finesse in a youthful key, and very pleasant to sniff. On the palate it's medium bodied, with rich slightly sour cherry fruit that gains definition from brambly sour cherry acidity, and is supported by powerful dusky tannins with slight greenish accents that flow into a fairly long savory sour cherry finish with bright slightly greenish tannic underpinning. It's quite elegant in a brash key, and also quite young, a wine that will work very now with grilled meats or roasts, but that will also age well for ate least a decade, and as it mellows also work well with stews, and perhaps be something to sip with like-minded friends. It is not a wine for everyone; it is demanding and demands attention, but if you are willing to give it what it asks, it will richly reward you.